The tetrahydroisoquinoline (THIQ) alkaloids are naturally occurring antibiotics isolated from a variety of microorganisms and marine invertebrates. This family of natural products exhibit broad spectrum antimicrobial and strong antitumor activities, and the potency of clinical application has been validated by the marketing of ecteinascidin 743 (ET-743) as anticancer drug. 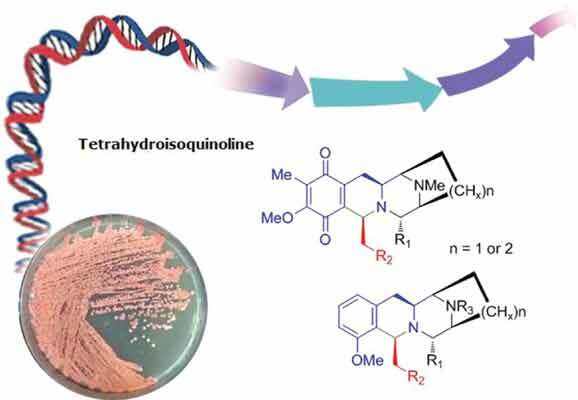 In the past 20 years, the biosynthetic gene cluster of six THIQ antibiotics has been characterized including saframycin Mx1 from Myxococcus xanthus, safracin-B from Pseudomonas fluorescens, saframycin A, naphthyridinomycin, and quinocarcin from Streptomyces, as well as ET-743 from Ecteinascidia turbinata. This review gives a brief summary of the current status in understanding the molecular logic for the biosynthesis of these natural products, which provides new insights on the biosynthetic machinery involved in the nonribosomal peptide synthetase system. The proposal of the THIQ biosynthetic pathway not only shows nature’s route to generate such complex molecules, but also set the stage to develop a different process for production of ET-743 by synthetic biology.